Room Sizes: 15' x 13.5' x 8' diagonal setup, 11' x 18' x 7-8' opens to 18' x 19' x 7-8', long wall and short wall setup, carpeted concrete slab floor, suspended ceiling and all walls finished with drywall (basement with small window on one side, which is concrete foundation wall with insulation). Review component retail: Kit with 120V R-core transformer $575, kit with 100V R-core transformer $500, fully assembled add $95. 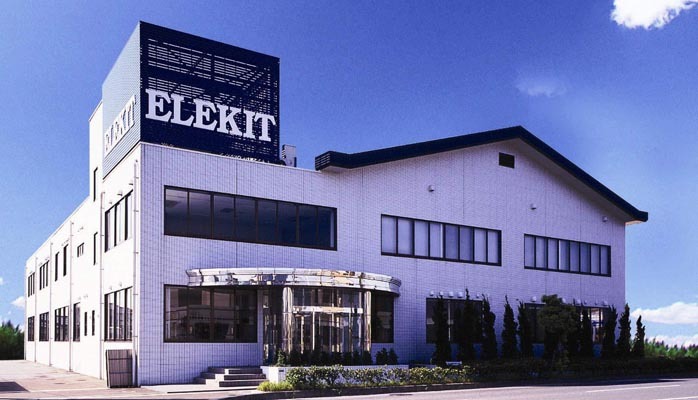 Elekit of Japan is not your usual audio manufacturer. In fact, when the company launched in 1973, it wasn't even in the audio business. It was one of the pioneers in educational science projects for the future engineers. The company's motto was fostering young scientific minds with all manner of innovative electronic kits while promoting family bonding through parental involvement. The company was officially incorporated in 1994, with the head office in Dazaifu, Fukuoka, one of Japan's ten most populated cities and a vital import harbour and industrial zone on the northern shore of Kyushu Island. Mr. Hidemi Iguchi is president, Ms. Emi Tamura in charge of overseas marketing and sales. Today, Elekit runs a work force of around 50 and produces close to 100 science project kits including dynamos and motors; sound-activated cars; water alarm and pumps; timer and LED clock; radios; LED light art; an animation mini theatre great for the future Pixarists; a traffic light model and electronic piano with two full octaves and eight instrument tones plus built-in memory to save your composition; ten different robots with sound commander, infrared sensor or PC interface board (some robot models have already landed on North American shores); eleven solar energy toys (cars including an amphibian model, a monkey, seagull, grasshopper, cable car and solar fountain); and even, I swear, a lie detector! Every year Elekit brings some 10 to 20 new products to market. According to the company records, the first TU Series product launched in 1986. Mr. Yoshitsugu Fujita has been one of the engineers instrumental in driving developments of these vacuum tube kits for the past many years. Mr. Fujita was born in Osaka in 1956 and raised in Fukuoka. He became interested in electronics in his higher elementary school grades and began to construct germanium radios and transistor radios. His first love with classical music was The Blue Danube sung by the Vienna Boys' Choir he heard in his junior high days. He eventually fell under the spell of music and audio. Soon he found himself gathering vacuum tubes from abandoned TVs and with humble parts permitted by his limited pocket money, he began building simple amplifiers or transceivers on aluminum lunch boxes or steel cookie cans. At the same time, he indulged in railroad models and made HO gauge trains of his own. It was during these junior high school days also that he obtained his HAM operator's amateur radio license. In 1980 when a university student, he bought the first-gen Sony Walkman, then a revolutionary product. From then onwards, he became interested in portable audio in general. The car audio in his first set of wheels was this Walkman plus a DIY IC amplifier. Busy schedules filled up with lectures and studies prevented him from building his home hifi amps and he settled for Marantz and a pair of Diatone DS-25B 2-way monitor, with the speakers still in use today. Then he discovered Dixieland jazz at a club and it became one of his favorite music genres. 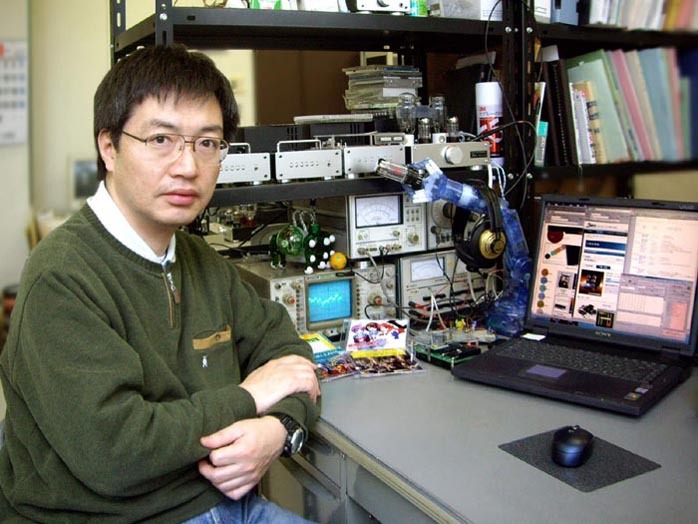 After graduating from Tokai University with a communication engineering degree, Mr. Fujita landed a job designing electronic systems for an automobile manufacturer before joining Elekit. In his present position, Mr. Fujita's life-long passion for audio electronics, model making and electro-mechanical engineering have finally found perfect solace and satisfaction. The solid DIY term of his youth helps him conceptualize, design and develop the TU series of amplifiers and CD player among many other Elekit products. 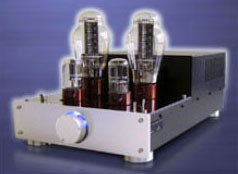 My encounter with Elekit dates back to the summer of 2005 when I first saw the advertisement of their Elekit TU-875 preamplifier in the Hong Kong magazine Audiotechnique. I was instantly intrigued by the compact chassis that embodied so many features at such an affordable price (current retail price is ¥31,290 for the kit). It was the fully assembled version that sold in Hong Kong back then. Without hesitation, I ordered two through Audiotechnique and thanks to my friends at the magazine, two cuties shipped to me in days. 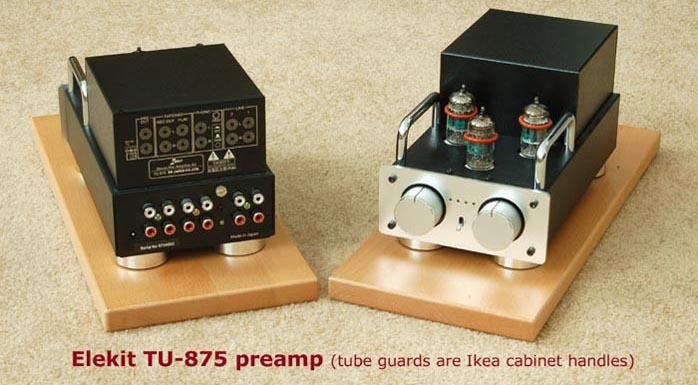 The TU-875 preamp is cleverly designed with a separate 7VDC SMPS isolating the main amplifier from electromagnetic noise. A sealed box DC-DC converter generates stabilized 200VDC to sustain the B+ rail of the three 12AU7 (or 5963/6189/ECC82) vacuum tubes. This user-friendly preamp is loaded with features you don't usually find even on a standard-sized preamp for much higher prices. It has right and left channel balance controls (I always find this useful) and the dial knob doubles as input selector (push button) for three line sources and one MC/MM phonostage which is selectable with a rear-panel switch. The phonostage is preset to 100-ohm/MC and 50K/MM utilizing J-FETs for the first stage followed by a low-noise equalizer to preserve the vacuum tube characteristics. Do not be dismayed if your cartridge impedance falls outside these values. The manual sports detailed instructions to match impedance by replacing a pair of resistors; likewise for changing gain from the original x 2.1 (6.5dB) to x 3 (9.3dB), x 4 (12dB), x 5 (15dB) or x 6 (15.5dB). Line source frequency response extends from 2Hz to 130kHz (-3dB) and RIAA equalization boasts a healthy 0.8dB tolerance. There's a pre-out to a power amp and a set of record-outs. S/N ratio is a respectable 94dB for line, 84.5dB for MM and 72.5dB for MC. Based on my audition, the old 'what separates a man from a boy is the price of his toys' definitely does not apply to this preamp. While sold for a kid's price, the performance is no joke. I have been using the TU-875 with a pair of modified Antique Sound Lab's Wave DT monos in either single or bi-amp configuration with results that do not match the price tags. the first audition. Not just that, I bit the bullet and accepted Victor's kit challenge. He kept reassuring me of an easy job as long as I could wield a soldering gun. It only made sense. If the majority of sales were in kit form, my review should reflect that and give a first-hand account.